This is a great place to camp if you are looking for family friendly and central to activities. Great bike paths, nearby shopping and restaurants, small town breweries, gondola rides and much more all close to your campsite... but not too close. You get a great "out in the woods" feel but are still close to convenience. Please note, if you are renting a generator in a campground with an elevation greater than 7,000 feet, you may be required to upgrade to a larger generator to accommodate the altitude. This is necessary for the proper operation of the generator and trailer during your stay. This is truly a jewel of the Sierras. The lakes and streams of this scenic loop have been a playground for anglers, hunters, and outdoor adventurers since the late 19th century. One look from the famous "Oh Ridge" and you will know where the "Oh" comes from. Beautiful lakes, small town wonder, hiking trails, and quiet star filled nights make this a popular summer spot. This region offers so much from beautiful lakes and streams to rugged mountain terrain. Enjoy a hike around Rock Creek near the upper watershed of the John Muir Trail. Wake up with the sun hitting the peaks on the backside of Convict Lake or fish for a record brown trout in Crowley Lake. You'll truly enjoy the beauty and splendor this region has to offer. Bishop is a unique area offering low elevation river fishing in the beautiful Owen's River and high elevation hiking and camping with the upper lakes near the John Muir Trail. Bishop is also home to the famous Mule Days celebration that happens annually for nearly 50 years! Explore the rock climbing areas near Pleasant Valley or even get a round of golf in at the Bishop Country Club. Campgrounds in this area are between the areas of June Lake and Mammoth Lakes and don't have large lakes or bodies of water but still offer some great "water" features including Deadman Creek and parts of the Owens River. Higher in elevation, dryer in climate, and a little rockier, this region is for the geologist in you. Hikes around obsidian fields from old lava flows and campsites hidden away in the pine trees offer a great vacation spot. Considered the eastern gateway to the Yosemite Valley, Lee Vining campgrounds are a great place to set up camp and take day trips into Yosemite, Mammoth, June Lake, or even visit the historic Bodie Ghost Town. Hike around mysterious Mono Lake or the Log Cabin mine or visit the small town and shops along main street in town. Camp and play near this geologic wonder. An easy hike to the rock formations knows as Devils Postpile or a bit longer and more challenging (but rewarding) hike to Rainbow Falls. Fish the middle fork of the San Joaquin River or just relax among the fields of gorgeous wildflowers. Images from around the Region. Agnew Meadows Campground is located in the Reds Meadow Valley, just west of Mammoth Lakes, California. Popular with large families, this campground provides access to some of the most spectacular wilderness in the Sierras and many outdoor activities such as horseback riding, fishing, hiking and photography. Agnew Meadows Group Campground is located in the Reds Meadow Valley section of the eastern Sierra Nevada Mountains, just west of the full-service community of Mammoth Lakes, California. Popular with large families, this group camping facility provides access to some of the most spectacular wilderness in the Sierras and many outdoor activities such as horseback riding, fishing, hiking and photography. Aspen Group Campground is a secluded, creek side camp in Inyo National Forest between Mammoth Lakes and Bishop, California. The group camping area is primitive and provides spectacular scenery, as well as fishing, hiking, photography and wildlife viewing. The campground has plenty of wide-open spaces and group picnic areas, making it ideal for large parties and family functions. Located off Hwy 120 in the Lee Vining area, Aspen Grove is at an elevation of 7,490 feet and has 45 campsites. Campsites can accommodate a 40 foot vehicle. Drinking water is available. Vault toilets are available. Each campsite has a bear locker. This is Bear Country. Please store food properly and don’t feed the bears. Located off Hwy 120 in the Lee Vining area, Big Bend campground is at an elevation of 7,800 feet and has 17 campsites on Lee Vining Creek. Near the Tuolumne Meadows entrance of Yosemite National Park. Campsites can accommodate a 30 foot vehicle. Drinking water is available. Vault toilets are available. 14 day stay limit. Each campsite has a bear locker for food storage. This is Bear Country. Please store food properly and don’t feed the bears. Located at an elevation of 8,600 feet, there are 11 designated first-come, first-serve campsites sited along Rock Creek affording wonderful scenery, fishing and a peaceful setting. Located between Mammoth Lakes and June Lake, near the Crestview area, this campground has 26 campsites surrounded by pine forest. This is a popular basecamp for fishing Deadman Creek, exploring Obsidian Dome and OHV/ATV trails in the Lookout Mountain area. Campground has pit toilets, no water so you need to bring your own and all sites are walk up. Named for the very large Jeffery pines that grace the site, Big Trees Campground is located along the banks of Bishop Creek and affords nice camping and fishing opportunities. Some sites in shade and some in open sunlight. Bear proof food storage containers available in the campground. 16 campsites. Bishop Park is one of the most popular campgrounds in the Bishop Creek Area. Located on the banks of the Middle Fork of Bishop Creek, Bishop Park has grassy lawns and campsites right on the creek. Many of the 21 campsites are walk in tent sites. Not recommended for large RVs, there are a few sites that will accommodate smaller rigs. The Bishop RV Park is a 42 space full-hook up RV Park on the Eastern Sierra Tri-County Fairgrounds. We offer 30 and 50 amp electrical, water and sewer in every space, Wi-Fi availability and immaculate and modern shower and restroom facilites. We are pet friendly, and centrally located within walking distance to dining, shopping and entertainment. A fisherman’s paradise; this campground has RV and tent sites in the meadow lining the upper Owens River, with unequaled fly, lure and bait fishing just steps from your campsite. For the nature lover in you, nothing compares to the panoramic views and breathtaking Sierra sunsets, featured nightly. Bishop’s most beautiful RV and tent-camping resort, with easy access to High Sierra trails, lakes and Bishop’s premiere 18-hole golf course. Amenities and staff dedicated to quality service make Brown’s Town a great location for a weekend escape. Camp High Sierra has been providing Family Camping since 1921. Located in the heart of Mammoth Lakes, this unique campground offers tent camping sites, trailer/RV sites with hook ups, rustic bunk style cabins, and FREE HOT SHOWERS for all registered guests. Located off Hwy 120 in the Lee Vining area. Campsites are walk up only. Coldwater Campground is located high in the eastern Sierra Nevada Mountains near the town of Mammoth Lakes, California. 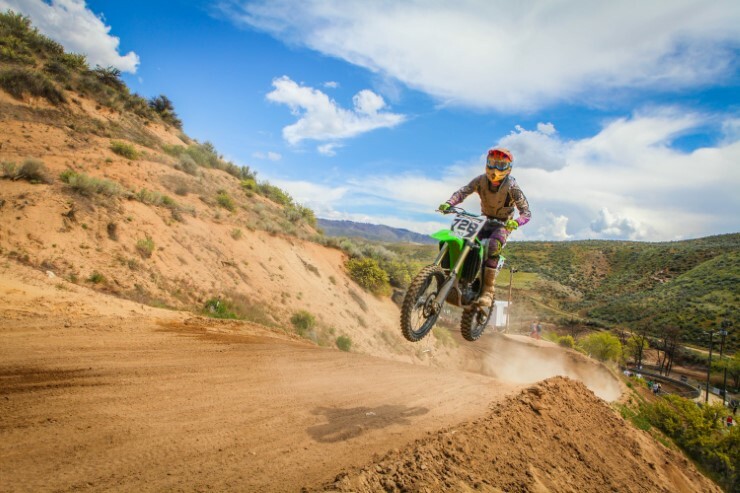 The surrounding national forest provides many opportunities for family fun, outdoor recreation and relaxation. Hiking, fishing, road cycling and picnicking are just some of the favorite activities available to campers. A short walk from Convict Lake, the campground is located along Convict Creek. There are 85 campsites with bear lockers at each campsite. Many sites are flat and suitable for RVs however hookups are not available. Showers may be purchased at near by Convict Lake Resort. Dump station is located along Convict Lake Road, 1/4 mile from campground. Located on the South Fork of Bishop Creek, Creekside RV Park is surrounded by some of the most picturesque scenery in the Eastern Sierra.Surrounded by high mountains, well stocked lakes and streams that provide some of the best fishing to be found. Camping out on Crowley Lake is perfect if you want to be in the middle of it all. Enjoy quick access to the biggest fish on the Eastside; also from here you’re just a short drive to Convict, Rock Creek, McGee, as well as the Mammoth Lakes Basin. The Crowley Lake Marina offers full hookup sites and dry camp sites, and its the only place where you can pick a spot right on the water. Crowley Lake RV Park is open year round. We feature full hook-ups (water, electricity, CATV and sewer), water & electricity sites and tent camping. We have clean showers/restrooms and coin operated laundry. Deadman Creek is a dry camping area. Elevation 7800 feet. 30 campsites. Campround will accommodate a 45ft vehicle. No drinking water is available. 14 day stay limit. No bear lockers available. East Fork Canyon is in a beautiful wooded section of Rock Creek Canyon, near Lower Rock Creek. Anglers, hikers and photographers enjoy this scenic location in the eastern Sierra Nevada Mountains of California. This beautifully wooded area is dense with pine and fir trees, with aspens that turn golden and shimmer in the fall. Sitting at an elevation of 8,900 ft., East Fork offers views of the taller mountain peaks that surround it. Forks Campground is located near the junction of the South Fork and the Middle Fork of Bishop Creek. Most of the sites are tucked into the aspen and pine trees, some sites are along the banks of Bishop Creek. Bearproof food storage containers available in the campground. 21 campsites. Four Jeffrey is a mostly shaded campground with gorgeous views of Table Mountain along the South Fork of Bishop Creek. Campers enjoy fishing and swimming in the trout-stocked creek. The nearby John Muir Wilderness provides plenty of hiking opportunities to view impressive lakes and glaciers. French Camp lies in the Rock Creek area of the scenic Sierra Nevada Mountains, near Tom’s Place and midway between Bishop and Mammoth Lakes, California. Its ideal location makes this campground a good stop for travelers on U.S. Highway 395 to rest overnight. Located in pine forest north of Mammoth Lakes, this campground has 66 campsites. While the sites are dry, with no hook ups they are large and can accommodate RV’s up to 45 ft. 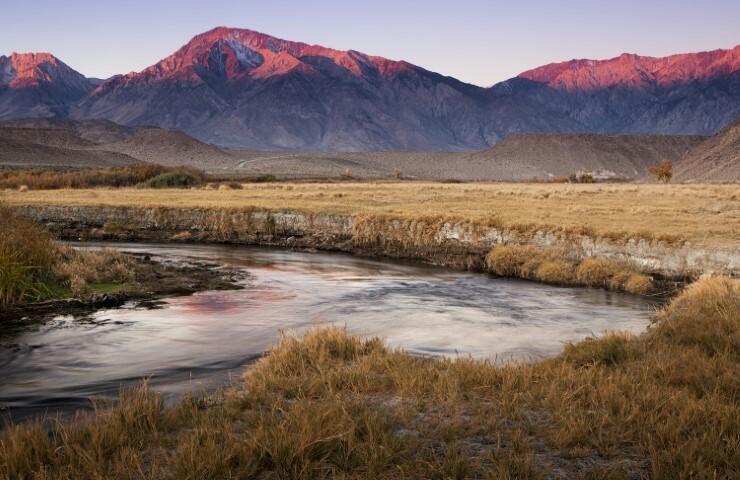 This is a great location to explore the nearby Owens River Headwater and Obsidian Dome areas. Golden Pine RV is a privately owned RV park nestled in the heart of June Lake. It is a short walk to Gull Lake Marina and the shops and eateries in town. Guests can make reservations by calling direct. Full service marina: docks, fishing boat rentals, and launch. Snacks and refreshments, tackle and gasoline. Waterskiing, wakeboarding and personal watercraft may be operated on Grant Lake after 10:00 am. Campground: 70 sites with shade trees, overlooking the lake. Water and sewer, no electricity. RV Length 60 foot max. Restroom and Shower Facilities. Open from the Last Saturday in April through mid-October. Gull Lake is located just outside of town along the June Lake Loop. The campground offers 11 campsites on Gull Lake. Sites will accommodate a 30 foot vehicle. Drinking water is available. Flush toilets are available. 14 day stay limit. Each site is equipped with a bear locker. Located between June Mountain and Obsidian Dome, at an Elevation of 8400 feet, this campground has 25 campsites surrounded by pine forest with nearby access to the tributaries of the headwaters of Owens River. Reservable full hookups sites located close to town and amenities. Campground is located on an alluvial fan, next to Horton Creek with an outstanding view of Mt. Tom and Wheeler Crest in the Sierra Nevada Range. Nearby is the Tungsten Hills. Wintering deer herds often graze in the early spring. Plenty of opportunities for exploring, hiking, sightseeing. The majority of these 14 campsites surround a small meadow and back up to Aspens and Willows. In late Spring wild Iris’ bloom along with other wildflowers in the meadow. A few sites are along Rock Creek. This campground is known for its peace and quiet. Maximum vehicle length is 26ft. Easy access to fishing, a marina and boat rentals make June Lake Campground a favorite spot for both families and anglers. The facility sits in the eastern Sierra Nevada Mountains in close proximity to the Ansel Adams Wilderness, Yosemite National Park and Mono Lake. The town of June Lake offers the convenience of shopping and dining, while the surrounding land and lakes provide ample outdoor recreation opportunities. The June Lake RV Park offers complete hook-ups: sewer, water, electric, cable TV, a fish cleaning station, and laundry room and is located in town just off the main road. No tent camping. No public bathrooms or showers. Lake George Campground is a dry camping ground, that does not take reservations. It is considered an active bear area and no swimming is allowed. The campground offers bear boxes, flush toilets and potable water. Lake Mary is the star of the Mammoth Lakes region. Of the 11 lakes in the area, Mary is the largest and most developed. Lake Mary Campground is a large facility with plenty of amenities in and around it. The lake provides a great base for activities like fishing, viewing waterfalls, hiking and backpacking. Lower Deadman Creek is a dry camping area. Elevation 7800 feet. 30 campsites. Campround will accommodate a 45 vehicle. No drinking water is available. 14 day stay limit. No bear lockers available. Located off Hwy 120 in the Lee Vining area, Lower Lee Vining Campground is situated at 7,300 feet and offers 51 campsites. No drinking water. Portable toilets. 14 day stay limit. Each campsite has a bear locker for food storage. At an elevation of 7660 ft., this seasonal campground is set among beautiful Aspen Groves lining the banks of Mill Creek. An on-site campground host provides fee collection services for the 36 first-come, first-served camping spaces that include restrooms, non-potable water spigots, picnic benches, fire-rings, and bear boxes. Located in beautiful Lundy Canyon just north of Lee Vining on highway 167, Lundy Lake Resort offers services for both campers and day visitors. The resort consists of 21 campsites, 5 full RV hook-ups, 8 Cabins, 3 huts and a boat launch. There is also a General Store with tackle, bait, and groceries. 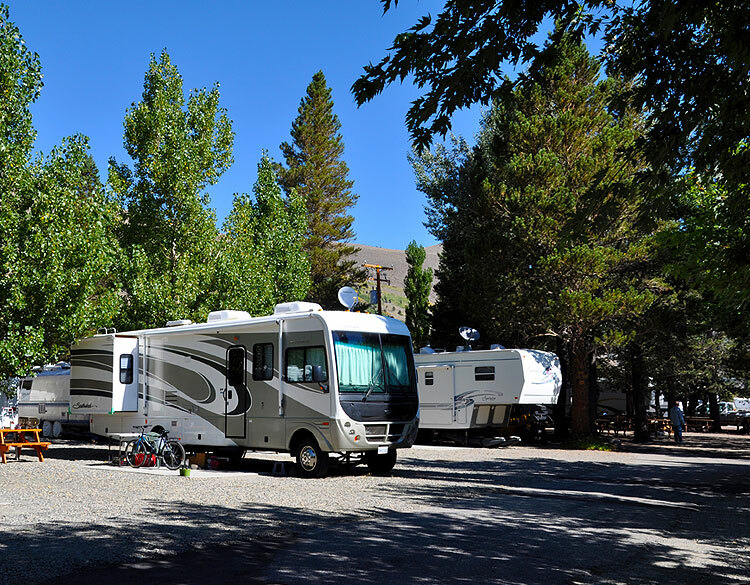 Mammoth Mountain RV Park offers full and partial hook-up sites, tent camping and cabins in the beautiful alpine town of Mammoth Lakes, CA. Our campground is located at the entrance of town, across from the Mammoth Lakes Welcome Center and Ranger Station on Highway CA-203 (Main St). McGee Campground provides a pleasant, sunny location for family camping between Bishop and Mammoth Lakes in the eastern Sierra Nevada Mountains. The campground’s proximity to U.S. Highway 395 and the adjacent John Muir Wilderness make it a hot spot for hiking, rock climbing, fishing, wildlife viewing, horseback riding, hunting, photography and geology study. McGee Creek RV Park and Campground is located in the Sierra Nevada Mountains of Mono County, California, at an altitude of 6,800 feet. We have RV sites (tent camping is welcome) with and without hook ups. Our family recreation facility is located off the highway next to Inyo’s Millpond County Park, with 60 RV and tent sites nestled in the foothills of the High Sierra and backed by the cool-running waters of a creek. Bring the family to a relaxing getaway at Brown’s Millpond Campground. Located in the Reds Meadow Valley, this popular campground has a narrow, single lane road that leads you to 27 campsites. This is a great camping spot that puts you close to many trails and other outdoor activities. Historically, there has been a high level of bear activity at Minaret Falls Campground. A bear-proof locker is located at each site at Minaret Falls Campground. Are you looking for an ideal destination to camp that is close to Yosemite National Park, Mono Lake, Bodie Ghost Town and scenic Tioga Pass? Well look no further! Mono Vista RV is a privately owned rv park located in the town of Lee Vining. Located off Hwy 120 in the Lee Vining area. Moraine Campground has 25 campsites that are walk up only. There are portable toilets. This campground is considered an overflow campground. New Shady Rest Campground is a large facility convenient to numerous outdoor activities and attractions in the eastern Sierra Nevada Mountains. The campground is popular for hiking, mountain biking, sightseeing and hitting the adjacent town of Mammoth Lakes for shopping and dining. The facility accommodates both tents and RVs. The outstanding lake and mountain views at Oh Ridge Campground make it a favorite spot for both families and anglers. It sits in the eastern Sierra Nevada Mountains in close proximity to the Ansel Adams Wilderness, Yosemite National Park and Mono Lake. The nearby town of June Lake offers the convenience of shopping and dining, while the surrounding land and lakes provide ample outdoor recreation opportunities. Old Shady Rest Campground is a large facility convenient to numerous outdoor activities and attractions in the eastern Sierra Nevada Mountains, and within walking distance of the full-service community of Mammoth Lakes. The campground is popular for hiking, mountain biking, sightseeing and hitting the town for shopping and dining. The facility best accommodates tents and small to medium-sized RVs. Palisades Group Campground lies along Rock Creek in Inyo National Forest, near Mammoth Lakes and Bishop, California. Well-suited for large families and groups, the facility provides access to fishing, hiking, scenic driving, photography and wildlife viewing. Pine Cliff Resort is a full-service facility offering tent, trailer and rv sites. We have a general store, gas, propane, on-site laundry room and showers. Located next to June Lake. Pine Glen is a group camping facility located in the eastern Sierra Nevada Mountains, within walking distance of the full-service community of Mammoth Lakes, California. Popular for large families and other groups of up to 15 or 30 people, the campground has access to a variety of activities, from fishing and mountain biking to hiking and photography, near some of the most spectacular scenery in the Sierras. A small, quiet campground just below Rock Creek Lake. 11 campsites. Year round fishing in the Owens River, located adjacent to Pleasant Valley Reservoir. Camping spaces available for larger RV’s. Open all year round. Pumice Flat Campground is located near the group campground in the Red’s Meadows and Devils Postpile section of the eastern Sierra Nevada Mountains, just west of the full-service community of Mammoth Lakes, California. This camping facility provides access to some of the most spectacular wilderness in the Sierras and many outdoor activities such as horseback riding, fishing, hiking, photography and geologic study of the dramatic landscape. Devils Postpile National Monument and the famous Ansel Adams Wilderness are nearby for campers to explore. Pumice Flat Group Camp is located in the Red’s Meadows and Devils Postpile section of the eastern Sierra Nevada Mountains, just west of the full-service community of Mammoth Lakes, California. This group camping facility provides access to some of the most spectacular wilderness in the Sierras and many outdoor activities such as horseback riding, fishing, hiking, photography and geologic study of the dramatic landscape. Devils Postpile National Monument and the famous Ansel Adams Wilderness are nearby for campers to explore. Reds Meadow Campground is located in the Reds Meadow and Devils Postpile section of the eastern Sierra Nevada Mountains, just west of the full-service community of Mammoth Lakes, California. This campground has flush toilets, bear boxes and is walk up sites only. Reversed Creek Campground is a small, shaded and private facility in the June Lake area of the eastern Sierra Nevada Mountains. Within a few miles, campers can access two lakes with fishing and boating opportunities, scenic views and the small town of June Lake. The campsites at Rock Creek Lake sit on a low hill overlooking the lake with great views and a few trees. This 28 unit campground is a perfect location for limitless mountain recreation opportunities including fishing, camping, hiking and horseback riding at the nearby pack station. Sabrina Campground is a popular destination on the Inyo National Forest. 18 campsites. Most of the sites are in close proximity to Bishop Creek. About half of the sites are in the shade the other half have a more sunny exposure. Sabrina campground is about 3 miles from Lake Sabrina and about 10 miles from South Lake, both popular fishing destinations. Sherwin Creek Campground is located in the eastern Sierra Nevada Mountains within 2 miles of the full-service community of Mammoth Lakes, California. Popular among anglers, hikers, off-road vehicle enthusiasts and photographers, the campground is near some of the most spectacular wilderness and outdoor recreation areas in the Sierras. Silver Lake Campground is nestled between Silver Lake and the dramatic scenery of the Ansel Adams Wilderness in the eastern Sierra Nevada Mountains of California. This is a great base camp for fishing, boating, hiking, picnicking, horseback riding and photography. The facility has creekside camping with a boat ramp and pack station nearby. Imagine all the comforts of your fully self contained RV just across the road from one of California’s most popular fishing lakes. That is what you will experience while having a wonderful vacation at Silver Lake the oldest resort in the Eastern Sierra. Tuff Campground is situated along Rock Creek in the scenic Sierra Nevada Mountains of California. It is convenient to Tom’s Place and U.S. Highway 395. At an elevation of 7,000 ft., it is lower than many of the region’s campgrounds and thus frequently one of the first campgrounds to open in the spring. Popular activities include hiking, fishing, wildlife viewing and viewing the area’s volcanic rock formations. Twin Lakes Campground is located in the eastern Sierra Nevada Mountains near the town of Mammoth Lakes, California. It offers lakeside camping with breathtaking scenery and many outdoor activities. The lake is a great base for fishing, boating, viewing waterfalls and hiking, and offers close proximity to the town’s amenities. Please note we do not park in spaces 56, 60, 61, and 62. Upper Deadman Creek is a dry camping area. Elevation 7800 feet. 30 campsites. Campround will accommodate a 45 vehicle. No drinking water is available. 14 day stay limit. No bear lockers available. Upper Soda Springs Campground is located in the Reds Meadow and Devils Postpile section of the eastern Sierra Nevada Mountains, just west of the full-service community of Mammoth Lakes, California. This campground has vault toilets, bear boxes and is walk up sites only.